Discover a thrilling new dimension in surround sound with the Marantz NR1606 A/V Receiver, which features Dolby Atmos immersive surround decoding, delivering breathtaking surround sound with today’s advanced movie soundtracks. With Dolby Atmos you’ll experience the same revolutionary 3D surround sound found in premium movie theaters, with the ability to create an overhead surround soundfield that dramatically expands the sonic space. And, via a future firmware update, the Marantz NR1606 will be able to decode DTS:X soundtracks, which also deliver an immersive 3-dimensional soundspace. 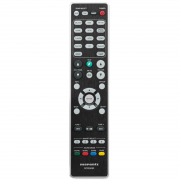 Whoever coined the phrase “bigger is better” never owned a Marantz slim-line receiver. 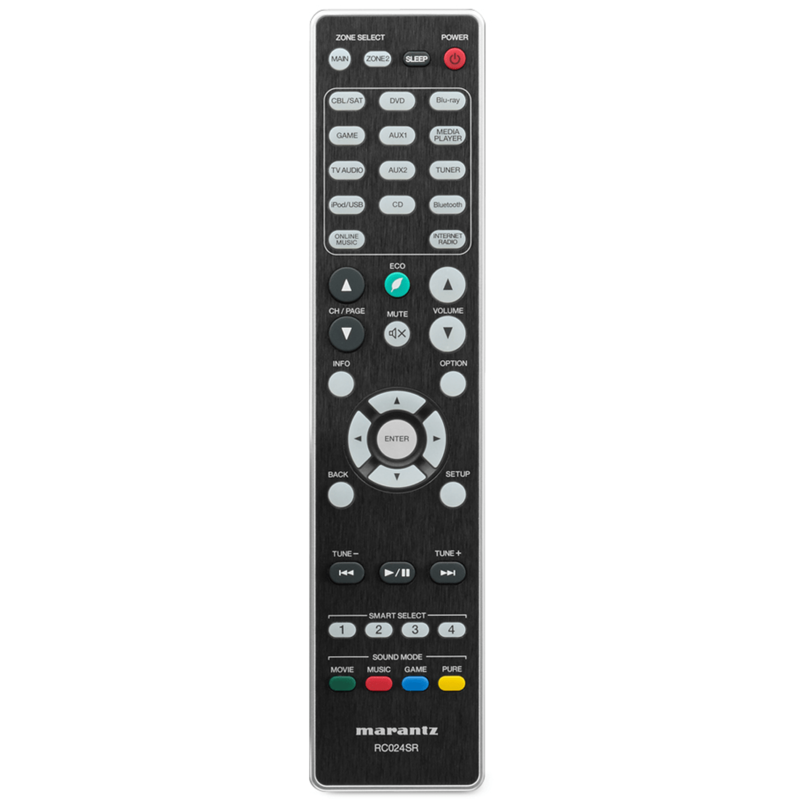 Our customers consistently rave about what big performers these low-profile receivers are, and the Marantz NR1606 comes loaded with features to satisfy home theater fans. 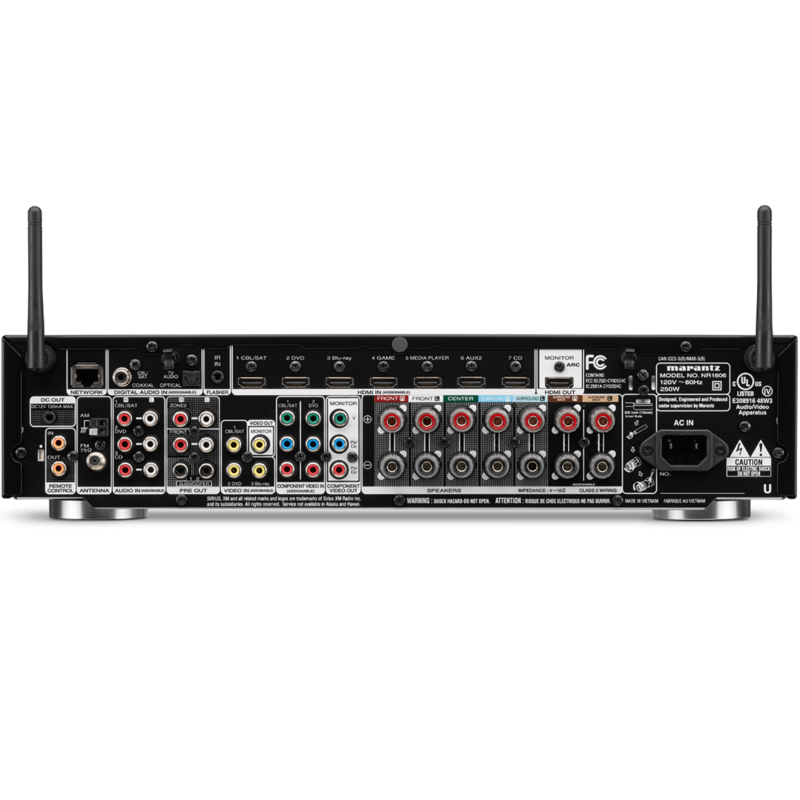 With 7.2 channels of thrilling surround sound and all of the latest video and music features, plus convenient smartphone control, this slim unit packs everything you’d find in a larger receiver into an unobtrusive design that fits nicely on just about any shelf or stand. 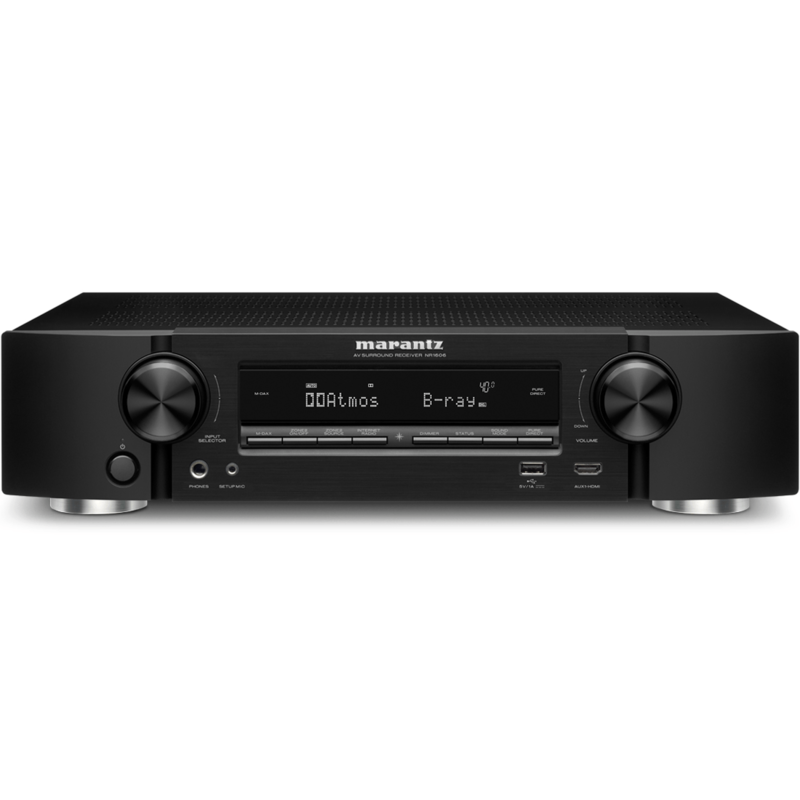 Every HDMI connection on the Marantz NR1606 is HDCP 2.2 compliant, so you’ll be able to take full advantage of current and future Ultra HD content with a compatible 4K TV. You’ll enjoy remarkable clarity and definition from 4K Blu-ray discs (a format we’re excited to see later this year), online video streaming and subscription-based services, and even home movies taken with a 4K-capable camera. You don’t have to wait for more content to be released before you can enjoy ultra-high-definition picture quality — the NR1606 can upscale lower-resolution signals to 4K, so all your video sources, including older DVDs and Blu-rays, will sparkle with new life. A technology that just made its debut in home theater receivers last year, Dolby Atmos creates the most lifelike, captivating surround sound of any audio format we’ve heard to date. If you’re watching a plane take off onscreen, your ears will follow it down the runway along with your eyes, and as it roars directly overhead you might swear your hair is blowing back. 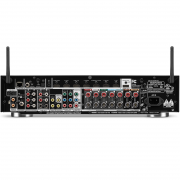 The NR1606 supports a 5.1.2 Atmos setup. If you’re ready to explore this new dimension in home theater sound, you’ll just need to add a pair of in-ceiling speakers to your five-channel system, or pick up a pair of Atmos enabled upward-firing speakers to project sound off your ceiling and create the height effects that make an Atmos system so riveting. 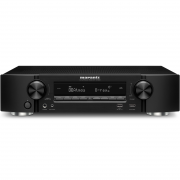 If you’re happy with 5.2-channel surround sound in your living room, the Marantz NR1606’s surround back channels need not go to waste. Reassign them to power a set of speakers in a second area, so you can relax and enjoy music out on the patio while someone else watches a movie in the main zone. The receiver’s surround back channels can also be used as height channels in a Dolby Atmos setup, or to bi-amp your front speakers for more powerful sound. With Wi-Fi, Bluetooth, and Apple AirPlay all built-in, you’re not likely to find yourself at a loss for great music at a moment’s notice. You’ll have quick access to your own digital music library and thousands of Internet radio stations from around the world. There’s also support for subscription-based services like Spotify, Pandora, and SiriusXM Internet radio, so you can listen to all of your on-the-go favorites through your home theater speakers. 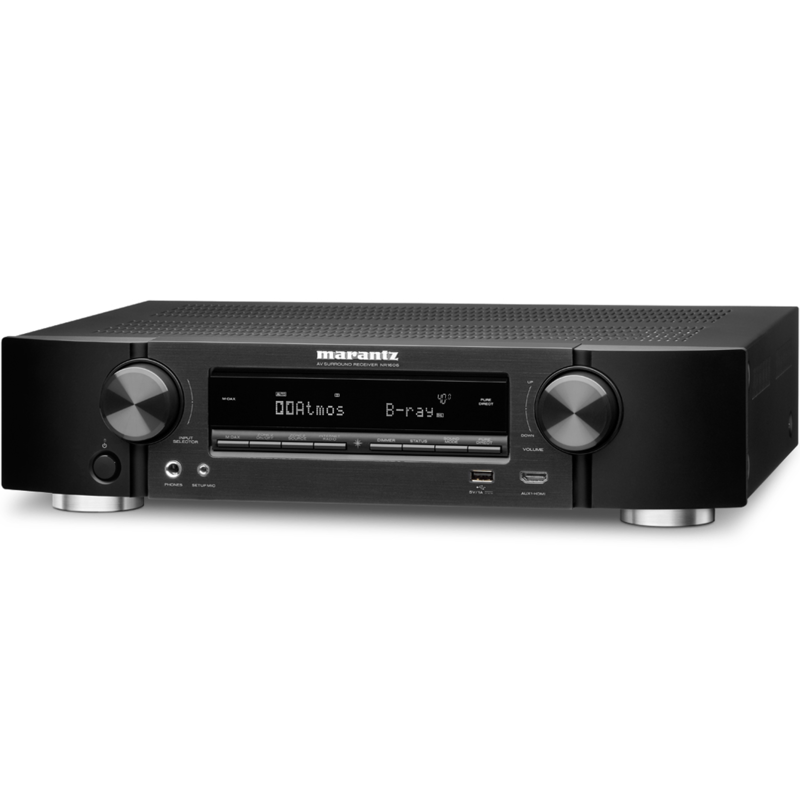 The Marantz NR1606 supports playback of high-resolution audio files so you can enjoy sumptuously detailed music. 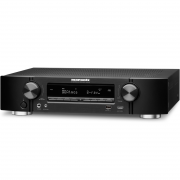 Marantz’s compressed audio enhancer revitalizes lower-resolution audio formats, letting you get the most out of any music source you select. And don’t be fooled by the modest amplifier rating. We hear from lots of customers that their 50-watt-per-channel Marantz receivers have plenty of power to fill small and medium-sized rooms.